The last few weeks has seen me concentrating on the big questions of light and consolidation. The Daubeny Library both benefits and suffers from being in its original laboratory setting. The context is wonderful and really adds to the uniqueness of the collection, but the light exposure it suffers from several 3 metre+ high windows which face the book presses is less great. I have been logging light levels over a number of months, as well as setting up a long term light test using samples of the dyed textile used for slotting. Light levels have become somewhat of an obsession due to the work I did on the reactive dyes, as traditionally, and somewhat unfairly, they have always had a reputation of being less light fast than direct dyes. At Daubeny, the UV light levels are encouraging but the visible light levels are slightly too high. It is a difficult space to regulate in light terms as it is used both as a library and a lecture room. Consequently I have been encouraging users to lower the blinds in the room after use, but this has had a variable degree of success. However, any lowering of light levels is a big improvement on the relatively uncontrolled exposure the collection has experienced up until the recent refurbishment of the laboratory. Consolidation in progress. Image reproduced with the kind permission of the President and Fellows of Magdalen College, Oxford. 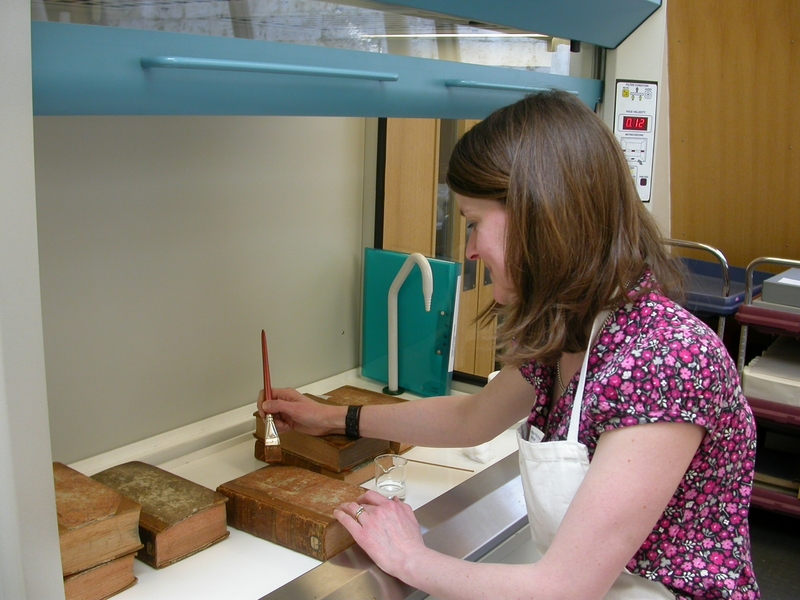 The chemically degraded nature of the majority of the leather covering the Daubeny books has also been a challenge. Early tests with the traditional consolidant mixture of klucel g in IMS showed considerable and unacceptable darkening of the leather, and a coarsening of the leather surface. Having done some research into the water content of common solvents, I settled on isopropanol as the solvent of choice. Unlike IMS, with a water content of up to 1%, isopropanol has a water content of less than 1%, and as such seemed a better bet not to darken the leather. I made a 2% solution in isopropanol by gradually adding the solvent to the klucel g, stirring all the time, and leaving it to fully dissolve overnight. This resulted in a very smooth, gelatinous liquid which when applied with a brush caused neither darkening nor streaks across the leather surface.